You may have seen this slogan plastered on the walls of public toilets, “Cleanliness is next to godliness.” One may find it interesting that though this seems to be an age-old advice, it is actually a relatively recent innovation dating from the 18th century, and promoted by the great Methodist preacher, John Wesley. But it wasn’t always like that. The different strata of society practiced hygiene differently at different times throughout human history. For the first-century Roman, being clean meant a two-hour soak in baths of various temperatures, scraping the body with a miniature rake, and a final application of oil. For the aristocratic Frenchman in the seventeenth century, it meant changing your shirt once a day and perhaps going so far as to dip your hands in some water. It was said that Napoleon wrote to his beloved Josephine, “I will return in five days. Stop washing”. The last two examples may seem strange but during the Middle Ages, water was considered a deadly substance and the general opinion was that bathing might unbalance the humours and lead to illness. The rich and the famous were no different. In fact, they may have taken this aversion of water and cleanliness to another level. One notorious example is Isabella of Castille, who with Ferdinand of Aragon, whom she married, united Spain and liberated these lands from the last Moorish kingdom. Isabella boasted that she had only ever bathed twice: on the day she was born and the day she married. She saw it as an act of piety. Bathing was an indulgence of the flesh; abstaining was a pious act. Cleanliness was not next to godliness. On the contrary, it was considered next to ungodliness. After the conquest of Granada, the Moors not only had to give up their religion to survive the Inquisition, they also had to give up bathing. Isabella and Ferdinand ordered the Moorish baths to be destroyed and bathing was strictly forbidden. With all this dirt building up, did the royals really stink to high heaven? We can only imagine how royalty smelt. This may explain the reason why Ferdinand and Isabella had only one child. They may have consummated their marriage just only once and kept apart for fear of killing each other with their body odour. But apart from the call to repentance, the thought of Ash Wednesday is quite literally, mortifying. The ashes aren’t just a symbol of our sin; they’re a reminder that what God brought out of the earth and gave His breath of life to also returns to the earth. Death is one great compost pile of dirt, dust, and ashes. Our dirt isn’t a smudge, or slight surface damage. It’s a reminder that what we are made of will one day be unmade. We are mortal, fragile creatures. We are part of creation unfolding … one small part in an intricately connected universe that has a beginning and most certainly an end. Yet, Ash Wednesday is also the day when we do feel special, special enough to be marked by God himself, marked not for extermination but saved from all damnation. Today, celebrates the beginning of God’s divine rescue plan. Though the dirt may be un-washable, the blot of sin indelible, the depths of our depravity great; the depths of God’s love for us is far greater. God will not let us wallow in the dirt, nor rot in our sin, nor are we irreversibly condemned to die the eternal death. The wonder proclaimed at Christmas and that which finds its culmination at Easter is this: God put His eternal Son in the same human body that you have. And He bears your humanity forever. “This is my beloved Son, down in the dirt for you.” “Incarnation into human dust for you.” Born to take on your dirt and sin and death. All the dirt we do and the dirt we are, Jesus became. “For our sake God made the sinless one into sin, so that in him we might become the goodness of God.” Christ, the Immaculately Perfect One, who knew no dirt, and dust and ashes and death became our dirt, dust, ashes and death so that He might breath resurrected life into our flesh. Uncleanliness has now been transformed into godliness. That is why the ashes are made in the sign of the cross. For on the cross, our sins have been forgiven, we have been redeemed. Christ’s very body was rend and beaten, judged and condemned, punished and killed for us. And then the Lord who breathed the breath of life into Adam, gave up His spirit. And His body was buried in the earth. “Remember that you are dust and to dust you shall return.” But there is an exception, Jesus. He would not stay in the dust and dirt of the earth. For on the third day, the Lord rose from the earth. The Potter stepped out of the mud and clay of His creation. And on Easter the true Adam, the truest Man there is, rose out of the ground once and for all. And here lies the great exchange. It is a marvellous reversal. In Christ’s holy death He makes you clean. In Christ becoming your dirt, He makes your sins that were scarlet, as white as snow. You brought only sin, dirt, and death…But Christ gives you His forgiveness, life – His very body and blood. And all of your dirt, sin, and death have been washed away. 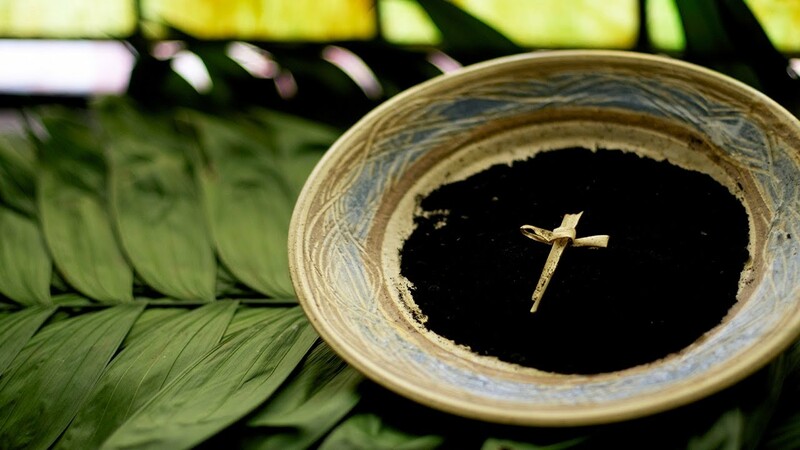 So today, at the beginning of Lent, we allow ourselves to be marked once again with ashes to remind us of who we are, we are sinners in need of repentance, we are mortal beings whose bodies will one day return to dust. But we await in hope. Because at the end of Lent, we celebrate life over death, purity over dirt, light over darkness. We await the breath of life that continues to re-create us and make us new again. So although you may question the veracity of the claim that cleanliness is next to godliness, we do know one thing for certain, God has made you clean. So, as you come forward to receive your ashes, the priest or the extraordinary minister of communion may make you dirty with these ashes, but only One can make you clean, pristinely and immaculately clean, it is Christ who assumed your dirt in order that He may make you white as snow! Christ has overcome your dirt and death by taking on the dirt and death we’re made of and all the dirt we’ve done. Our ashes, and weeping, and mourning may tarry for the night, but the joy of Christ’s resurrection comes in the morning.